You guys- are you loving all of the book giveaways as of late?? Hopefully there will be more this summer and you can snag a fun new read. In the meantime, here is another great book and it isn't a romance! I know, I'm getting crazy on you here. When the artist Marianne Glass falls to her death, everyone insists it was a tragic accident. Yet Rowan Winter, once her closest friend, suspects there is more to the story. Ever since she was young, Marianne had paralyzing vertigo. She would never have gone so close to the roof's edge. Marianne -- and the whole Glass family -- once meant everything to Rowan. For a teenage girl, motherless with a much-absent father, this lively, intellectual household represented a world of glamour and opportunity. But since their estrangement, Rowan knows only what the papers reported about Marianne's life: her swift ascent in the London art world, her much-scrutinized romance with her gallerist. If she wants to discover the truth about her death, Rowan needs to know more. Was Marianne in distress? In danger? And so she begins to seek clues -- in Marianne's latest work, her closest relationships, and her new friendship with an iconoclastic fellow artist. But the deeper Rowan goes, the more sinister everything seems. And a secret in the past only she knows makes her worry about her own fate . I haven't been reading enough thrillers and I always forget about that until I get a good one and then I wonder why it's not a genre I go to automatically. Also, Lucie Whitehouse is a new to me author and I am in love. It's been about a week or so since I finished the book and I still can't remember what book this one reminds me of, it's like on the edge of my brain and I'll remember at some bizarre time and forget to tell you, but I think maybe that's why I liked this one so much. The book itself is billed as a psychological thriller, which it is, but it does have a little romance in it, but not enough where you would call it a romantic suspense, if that makes sense. I think every good thriller gives you tastes of another genre or two and this one does just that, it keeps you on the edge of your seat with the plot as well. We have Rowan, who learns of Marianne's sudden (and kind of suspicious) death via phone call. The two were once great friends but had a falling out years previous that they never truly recovered from. I will warn you that there is quite a bit of backstory which I suppose you need, taking into consideration that without it you wouldn't have any idea why they had a falling out and how they both ended up where they were. So though it may seem tedious to stick with it, keep going because once you get through the backstory and you get caught up on the last ten years, you start getting into the meat of the story- how did Marianne fall to her death? Can Rowan figure it out in time and ultimately save herself? Are any of the characters who they pretend to be? I can't obviously go into it without ruining it for you, but I'm telling you to stick with it. There were a few times in the book where I was taken off guard and I found myself re-reading passages to make sure I read what I think I read, points that turned the course of the story for me, which is SO FUN because it's not very often that I am actually surprised by something in a thriller. So that alone makes me give it 4 stars. The only thing keeping me from giving it 5 stars is the fact that it does start out a bit slow and I worry that all of the history and backstory will turn someone off, but I really think if you would just get through it (it's like the first 80 pages or so?) you will see it was all worth it. If you are in the mood for a thriller, definitely pick this one up, which you can do on Amazon right now! In the meantime, you can find Lucie on Twitter and Facebook- she has a few other books you might be interested in as well. 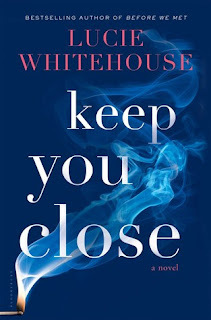 If you're feeling lucky, I'm giving away one copy of KEEP YOU CLOSE (US/Canada) only! I read novels by Jacqueline Winspear which are fascinating. I'm so glad that you stuck with it and ended up loving this book! Thanks for being a part of the tour. Did you enter to win a free book? Maybe you won.. Candidate for Murder Spotlight & Giveaway! And then we had cheesecake. Kind of. Wisconsin Dells was... the best decision EVER. Sleepless in Manhattan and giveaway!! So yeah, I've got a toddler. It's weird.